A new little mare just came to us. 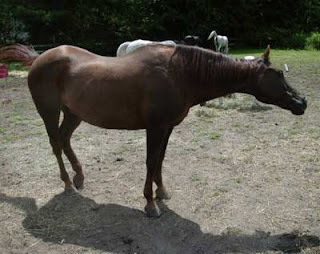 She was a camp horse who put her foot through a wall, fell down, and hung there for an unknown period of time, but long enough to do severe damage to her pastern and get a large and painful pressure sore on her hip. The camp personnel and the vet did an awesome job with her care, but time was running out. With months of special care and recuperation time needed, the camp was closing and she had no where to go and no one to care for her. 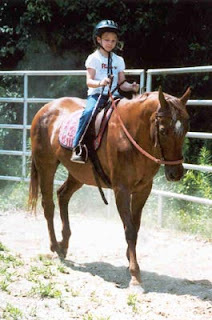 We are no longer able to stay at our current location and I was determined not to take anymore horses until we moved. But…maybe it was the prayers being answered of all the little girls that love her. I knew she had to come to us. When she arrived she looked at me as if she knew me. All the lights were on in her eyes and when she jumped from the trailer, wounded leg and all, she trotted straight to her stall. She had just come home. This was where she wanted to be, the search was over. She looked at me and tears began to fall from her eyes. She put her nose in my hand and nickered softly. I think maybe she said, “Thank you.” This really happened! Even now whenever one of us approaches her, she cries. Her name was Roxy, but we call her Pretty in Pink. 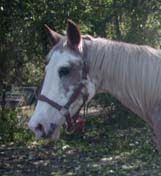 This pretty little mare is a sabino pinto with a silver and gold mane. She looks very Spanish and is the kind of horse little girls fall in love with. Pretty is supposed to be 15 years old, but upon inspecting her teeth I found bottom front teeth missing and top teeth broken. She appears to have broken ribs on her right side and asymmetrical shoulders. Upon examination by our own vet it was discovered that she is much older than 15, but it’s difficult to tell how much because of her damaged teeth. I estimate she’s over 20. She eats well and now that she’s off antibiotics she’s gaining weight. Her wounds are healing well and it appears no permanent damage has been done. Her spirit reminds me of my precious Stormy, the reason Eye of the Storm exists. I have received an incredible gift in this horse. I thank all the powers at work that brought us together. Our fundraising efforts are never-ending. Please, please, we are so desperate for money to care for our horses. We currently have 15 horses. Ten are completely unplaceable and will be offered sanctuary for life. We care for our horses as if they were million dollar show horses. We keep them deeply bedded and feed them only the best. That is very expensive. We are 100% volunteers, none of us are paid. All donations are tax deductible. We have all the supplies we need; we just need money for feed, bedding, veterinary and farrier expenses. Thank you. Remember, you can always help visiting the sponsors in the Google ads too! Little Moon is the pretty - but naughty - little stallion who came to us last year. He had spent all six years of his life with his mother. She taught him to be respectful of mares and unlike the stud colts that are separated from all other equine contact at weaning, he was socialized in a herd situation. The herd consisted of his mother and himself. He has been gelded (thank GOD)! He has settled in well with our group and is turned out next to Butterfly and another mare in adjoining areas. He’s not good with the other boys yet but that’s okay. He probably won’t ever be a child’s pony either! He has a beautiful little peach ice cream colored face with huge dark rimmed eyes – eyes that tell it all. He is often very agitated, almost frantic. He thumps around in his stall until I can barely stand him. One day I went over and put my arm around his neck. I made myself be calm and I asked him, “What is it Moon-Muffin? What is it you want?” He leaned into me and put his nose so gently into my hands. I felt the most profound feelings of sorrow, a longing and sadness that made me cry. Translated loosely from horse to human, he wanted his mommy. I felt him become calm. The tension left him and he relaxed against me. I know somehow we had just communicated and he was at peace. Knowing how Nessa grieved for her daughter for ten long years, I’m aware that permanent bonds are formed between mother and child when they spend years together. If Moon wanted his mommy, so be it. I promised we would get her. The only problem: Mommy was on Martha’s Vineyard and also as wild as a deer. 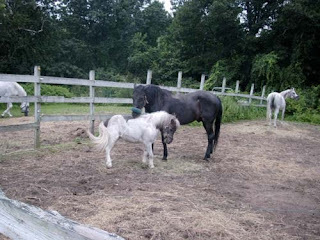 Laurie is the founder of Vineyard Miniature Horse Rescue where Cocoa, Moon’s mom, lived. Laurie is another woman running a rescue entirely on her own and is both very busy and under funded. She and nine of her friends took three hours to corner Cocoa and get her into a trailer. In the process one friend was kicked and another dragged over the fence when Cocoa jumped it. No doubt Cocoa was not as excited about seeing her son again as he was about seeing her! After an uneventful trailer ride Cocoa arrived at Eye of the Storm. Moon was so happy to see his mommy again! They immediately began to groom each other. Cocoa has a grubby lead rope attached to her halter as she is still difficult to catch (what an understatement). But they are together again, that’s all that matters, forever. The New England Cable News Network interviewed Nina Arbella of Eye of the Storm for a segment on the high cost of horse ownership in today's economy. Two days after Nessa’s death, my friends Delaine and Becky came all the way from Illinois to visit me. Their horse D’Amigo is doing well on our Bess’ Choice herbal for the Cushings horse. They wanted to meet me in person as we had talked only on the phone. I have concluded that in the event of the death of one of my horses something odd happens to me. Though I know I’m doing and saying things that might be strange, I can’t seem to stop myself of “fix my problem.” I know that sounds vague as I’m not sure exactly what I’m trying to say. I used to think it was as if “who I am” is shattered like a piece of glass, but that’s not exactly accurate. It’s more like a drop of mercury. It spatters in all different directions, but gradually, bit by bit, the drops are rounded up until it all becomes whole again. The spattered bits of personality and spirit eventually become the reasonably sane and sensible being that is me again. I guess it’s some kind of coping mechanism. We all probably have a form of it. Throughout Nessa’s six weeks of illness I found myself feeling very calm. Maybe Nessa herself had a bit to do with that. She just wouldn’t let me worry about her. Or, it could have been the peace of Jehovah that excels all thought. Maybe the loss of her spiritual help made me spatter after her death. Who knows? I just want to apologize to Delaine, Becky, and all others who had to deal with me at that time. My drop of mercury is me again. P.S. Delaine and Becky, I hope you still managed to have a good time. So sorry again. It was just too soon for met to cope with life as normal, though I did try very hard for you. Postponing my grief took its toll. On March 22, 2008 at 9:30pm my Nessa died after a six week long illness. She was 36 years old. I could write pages and pages of things about my Nessa, but what it all boils down to is she was one of the best things that ever happened to me. She was brave, she was tough, and she took better care of me than any human ever has. She gave her all without ever taking. It was an honor to care for her in the last weeks of her life. That meant I could finally give something back to her. She was so sad when she came to us ten years ago. Her beautiful little face showed it, her spirit, too. When she found herself in her very own stall with lots of bedding and food that she didn’t have to fight for, she was very appreciative. Slowly, little by little, her tentative spirit grew stronger. A fire came back into her eyes. For ten years she carried me, fearlessly, on her bare back because a saddle hurt her. She led the way. All other horses were confident in her presence. Her spirit soothed their’s. For six weeks I waited for her time. It was now her time. She was going to die that night with or without our help. The vet arrived just as she was going down for the last time and we sent her on her way. She galloped off into the future to the field of grass where her daughter “Baby” met her sometime after the resurrection. Six days later at 9:30am as I was watching “Ellen” on TV I got this profound feeling of peace, love, and gratitude from somewhere. I recognized Nessa’s message as she had been sending them to me for the last en years. She was there. She never died after all. My Nessa.